On this anniversary of the surrender of Richard the Lionheart to Duke Leopold of Austria on December 20 (or the 21st), I thought I would take a look at the events in the Fall of 1192 and other historical background leading up to that day. The Third Crusade ended with a truce in September. King Richard set sail for home on October 9, 1192. To the west, the quickest route to Richard’s realms was via Sicily and Marseille – the route he had taken in 1190/1191 to the Holy Land. But word reached Richard that he’d not find safe harbor in Marseille. Raymond, Count of Toulouse, an old enemy he’d engaged with in border disputes in Aquitaine, planned to seize him there. The Lionheart abandoned his buss in Corfu and, dependent on which history you read, either: 1) had a run-in with pirates; or 2) hired two privateer galleys for 200 marks. With a small group of trusted companions and the 2 galleys, Richard sailed north from Corfu battered by one storm after another. In early December, the galleys were driven ashore by storms somewhere between Aquileia and Venice. Richard’s potential overland routes presented as many hazards as the sea routes. Travel west meant traversing the Kingdom of Italy (ruled by the Holy Roman Emperor, Henry VI), the treacherous passages through the Alps, and the lands of King Philip of France. The northeast route would take the returning crusaders through lands subject to Henry VI, and Leopold, Duke of Austria. King Philip was no doubt delighted by Toulouse’s actions. Philip – supposedly Richard’s ally in the Holy Land – had returned to France after the fall of Acre in July 1191. He had invaded Richard’s lands in Normandy and stirred rebellion amongst Richard’s barons while Richard marched towards Jerusalem. Richard had also jilted Philip’s sister Alys to marry Berengaria of Navarre in 1191. Three hundred miles of enemy territory. Could Richard and his 20 companions make for Bohemia, a country whose ruler was no friend of Henry VI? From there, Richard could go to Saxony where his brother-in-law Henry the Lion ruled. Safe passage to a port on the North Sea would be assured. Richard had disguised himself as a merchant, but acting the part did not come natural. His large retinue spent lavishly and attracted the attention of the locals. And Richard’s reputation and looks – 6’5″ with reddish-gold hair – set him apart from most men. To keep Henry VI and Leopold off his scent, Richard agreed that the majority of his party would stay behind in the town of Friesach. The plan had worked, and Richard was long gone with two companions, William de l’Etang and a German-speaking boy he had hired. At one point, they raced almost 150 miles in 3 days. Fifty miles from the safety of the Moravian border, Richard stopped in the Vienna suburb of Erdburg. Ill with fever and exhausted by his ordeals, he was unable to go any further until he rested. Unfortunately, the German boy raised suspicions when he went out for food on three successive days. His manner and his dress, which included a fine pair of Richard’s gloves, were reported to Henry VI’s secret police. The boy was questioned. 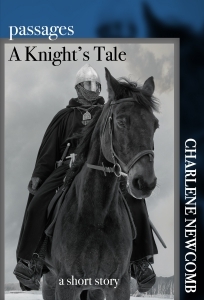 Whether he led soldiers to Richard or told them his location under torture is not clear. And the circumstances of Richard’s seizure are also disputed: he was either abed with fever or pretending to be a chef in the kitchen. A chef wearing a large signet ring would have been highly unusual (but it certainly makes for great fiction)! The contemporary chronicles report that Richard refused to surrender to the soldiers who came for him, and insisted he would give himself up only to Duke Leopold. Leopold imprisoned Richard at Durnstein Castle. Though the Pope had declared safe passage for men who had taken the Cross, that did not deter Richard’s enemies. Philip of France, Henry VI, and Leopold of Austria – their hatred for the King of England must have been intense for them to risk excommunication. Leopold turned Richard over to Henry VI, and reports of machinations between Philip and Henry VI continued over the course of about 13 months. Philip conspired with Richard’s brother John, Count of Mortain, offering Henry more silver to keep Richard imprisoned while John secured his hold on England. Eventually, in February 1194, Richard was released for the ransom of 150,000 marks. Note: the translation of the Itinerarium peregrinorum et gesta regis ricardi notes December 20 as the date of Richard’s capture; other sources note the 21st. De Hoveden, R. (1853). The annals of Roger de Hoveden, comprising the history of England and of other countries of Europe from A. D. 732 to A. D. 1201. (Henry T. Riley, Trans.). London: H. G. Bohn. (Original work published 1201?) Gillingham, J. (1978). 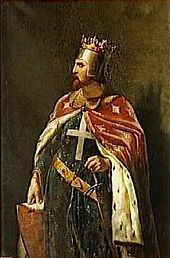 Richard the Lionheart. New York: Times Books. McLynn, F. (2006). 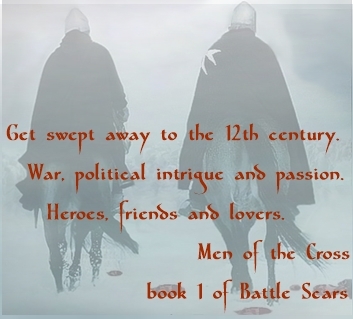 Lionheart and Lackland: King Richard, King John and the wars of conquest. London: Jonathan Cape. 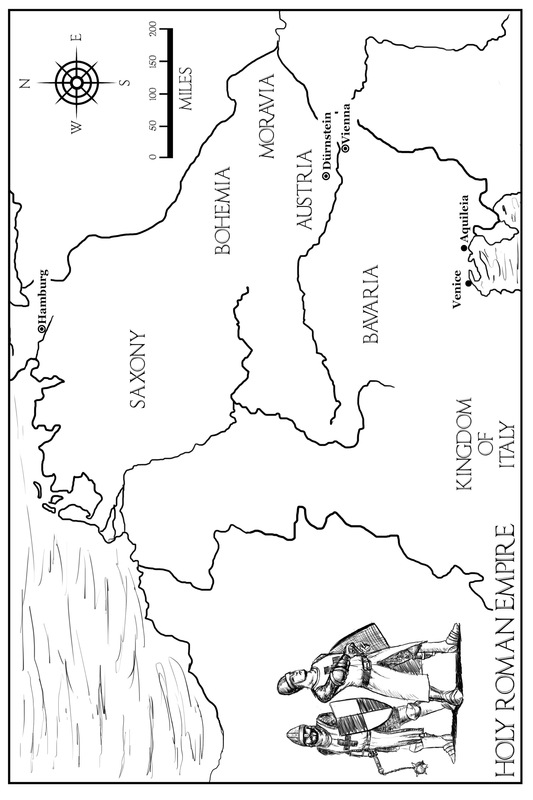 Map of the Holy Roman Empire by Dennis Lukowski as commissioned by the author for Men of the Cross, and used with the artist’s permission.